Fried chicken, grits, and Vidalia onions are often associated with the state of Georgia. You could probably add a bowl of collard greens or perhaps even barbecue, although, most southern states will try to lay claim to the best barbecue. But nothing says Georgia more than peaches. After all, it’s known as The Peach State. For us, (shhhh…) Georgia peaches are quite good, but honestly, South Carolina peaches are better. 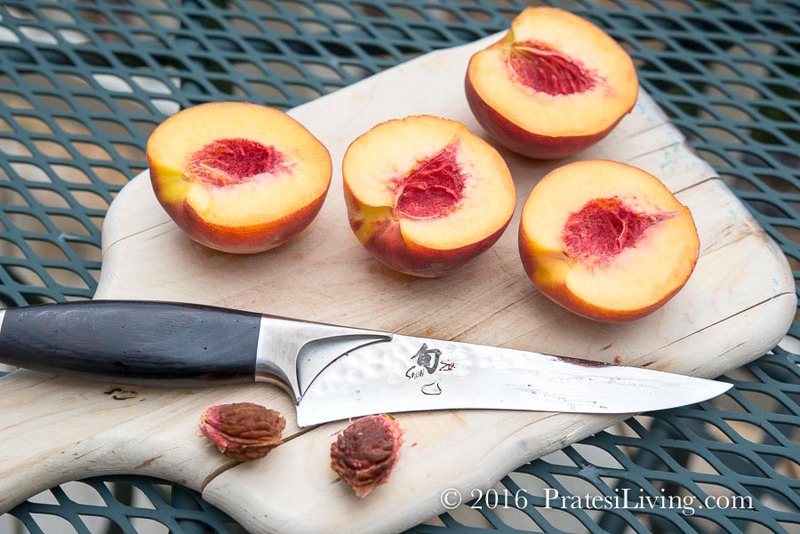 The mid-to-late season freestone or cling free peaches are best of all as they’re typically the sweetest and perfect for serving in salads or using in baking and cooking since the pit pops right out (hence, the name, cling free). Unfortunately, South Carolina peaches are hard to find in Atlanta. We used to get them in North Georgia on the way to the home we used to own in the North Carolina Mountains. That’s what I miss most about that house – access to such incredible fresh produce available at several farmers’ markets in the area. After a recent trip back up the mountain to escape the summer heat, we stopped at one of our favorite markets, Osage, in Clayton, Georgia, on the way back to Atlanta. Luckily for us, freestone peaches were in season and plentiful, so we brought some home. Just as we remembered, these were the very best peaches of summer: juicy, sweet, and incredibly flavorful. 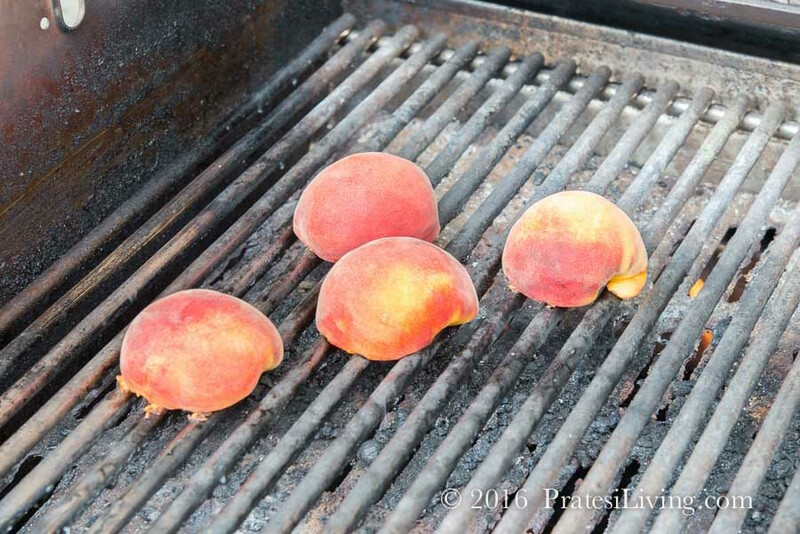 With quite a few peaches ripening quickly, we decided to grill a few of these beauties for a composed salad. 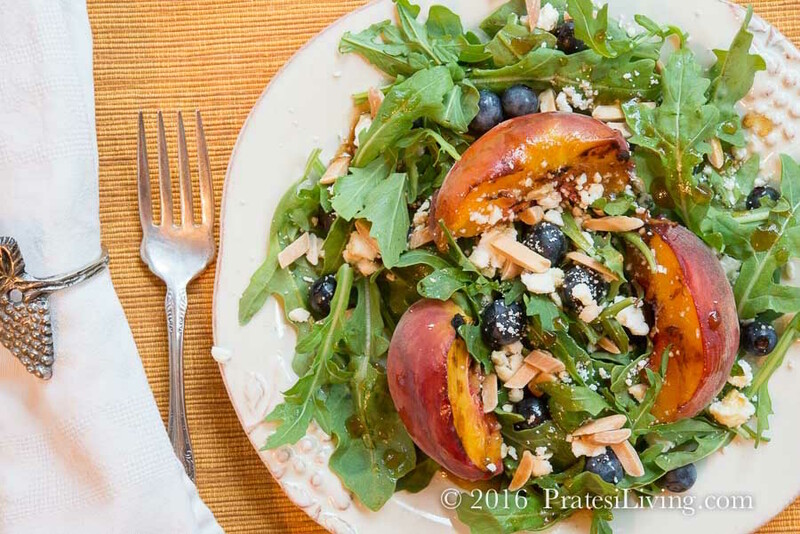 Combining several of our favorite salad ingredients, this Grilled Peach and Blueberry Salad is like a big bite of summer. 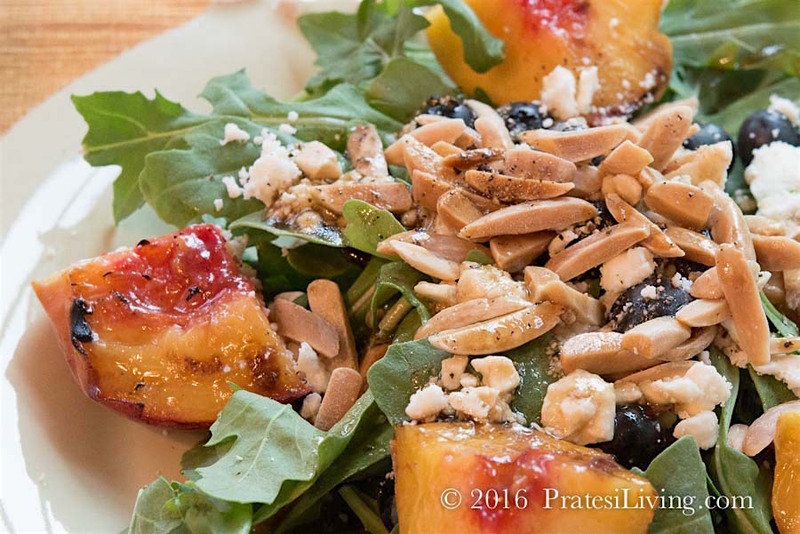 The sweet, fresh fruit is a nice contrast to the peppery arugula and salty feta cheese and the toasted almond slivers add great texture and crunch. For the dressing, I used a new olive oil I was trying from Pasolivo, a small producer of handcrafted olive oils from Paso Robles, California. The Kitchen Blend version is described as “buttery” and while it had a nice buttery texture, we picked up peppery notes and likened it to a Spanish olive oil. With its richness, I thought it would be perfect to pair with one of my favorite artisan products, Honey Ridge Farms’ Balsamic Honey Vinegar, which is both tangy and sweet. 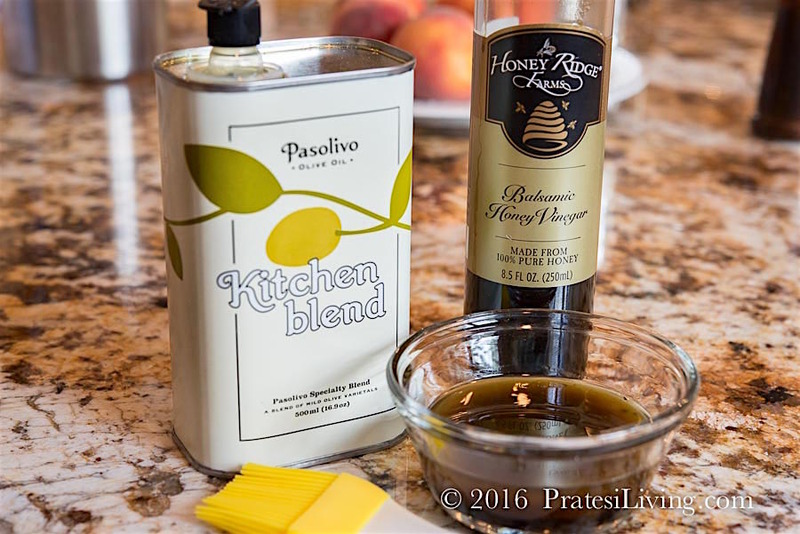 I love using it in dressings since it combines balsamic vinegar and honey, eliminating the need for an additional sweetener. The dressing is a simple vinaigrette and beautifully complements all of the sweet, salty, peppery, and crunchy components in the salad. Each bite was a burst of flavor and it’s just the right blend of ingredients for a healthy, beautiful, and flavorful seasonal salad. As I watch the days in August zip by on my calendar, I’m making the best of the last of summer’s produce. Peaches and corn are two of our favorites and we’re enjoying them whenever we can before they’re all gone. This is a composed salad, so you can use whatever portions of the ingredients you prefer. 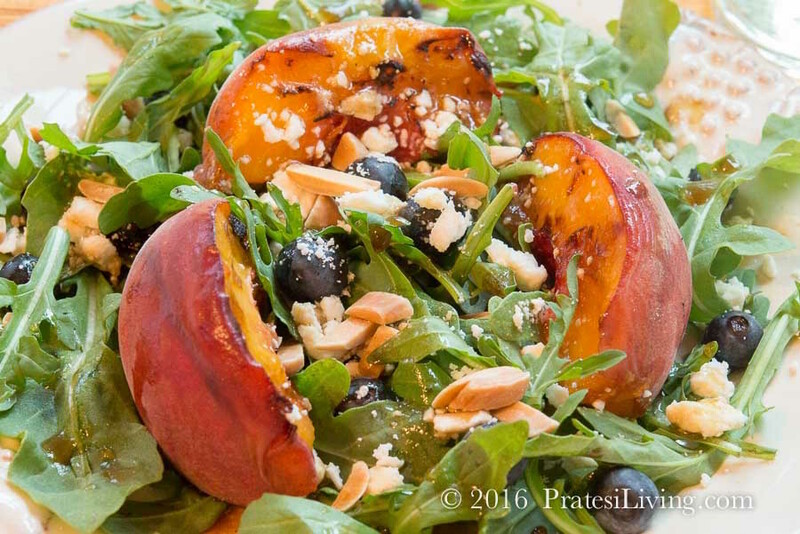 Prepare as many plates of the composed salad as you’ll be serving, layering arugula, roasted peach halves, fresh blueberries, feta cheese, and roasted almond slivers. In a small bowl, whisk all ingredients together until blended and emulsified. Taste for seasonings. Drizzle dressing over salads. Serve immediately.